Making films, telling stories and helping companies communicate since 1985. Atomic Imaging/Golan Studios is your full-service film/video production, integrated media, digital imaging and television sound stage/studio rental facility. Lights, Cameras and Plenty of Action! For more info please email Candice or call (312) 649-1800 x5703. Did you know that by 2018 more than 69% of all the Internet traffic will be provided through videos? People love receiving and sharing information through videos. This is why Chicago video production companies are in such high demand. Digital marketers are continuously searching for reputable video production service providers that can promise professional, high-quality videos. Whenever you are looking for a video production house, there are some tell-tale signs to key you in on whether you will be provided with top-notch services or not. 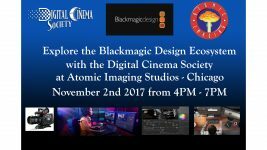 To help you choose the best video production in Chicago, the following 5 tips will give you a better idea on whether the final product will be a masterful done. 1. Is there a plan? Planning will be the key to your video’s success. If the production company you are working with doesn’t discuss with you a plan at the very start of production, then you might want to steer clean. Planning is at the very core of video production. A script needs to be written, either by you or the video production company. If it has integrated media services, then it should offer scriptwriting. Sort through the relevancy of each key area you want to see materialize on camera, and then move ahead. The quality of your video production services will completely rely on this step. Always remember that the competition is cut-throat in today’s market and you cannot survive until you have something unique to offer your audiences. Your video subject might focus on a general idea, but the concept should be completely original and captivating. The crux is copying can’t be their calling card. Well, that’s an important question and before we answer it, let us tell you, your audience is very smart and they take note of every little happening. This means you can’t fake your office area to be the set. You might need to rent a studio, use a green screen, or prepare for a location shoot. A professional digitial medial production company should be able to handle all of these options for you. Light and sound are two major elements of every video, including your own. By being just a smiddgen off the mark, the entire set up may be marred along with the video’s quality. This is the last thing any video production company wants to face. Setting up the required amount of light and sound is critical. This can be done to make sure the camera is white balanced, the shadows are eliminated and the ambient noise is minimized. If that’s done well, then you know your video production company is on the way to making a captivating video. It takes no more than 6-7 seconds to grab the attention of audiences. So, either you win or lose them in that short period of time. An experienced Chicago video production team will know this. Once the filming is done, the video will need to be tailored your audience. The tone, pace, structure, text, each of these elements has equal influence on the overall quality.